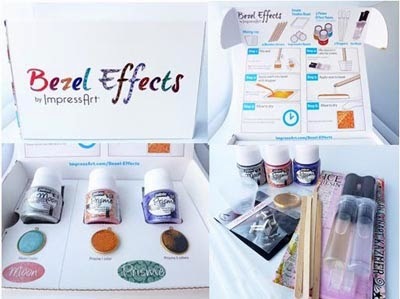 PJTools, the people behind the awesome Impressart metal stamps and jewelry supplies I wrote about before have come up with another cool product! They have recently launched Bezel Effects. This new line features high quality products including special effect paints from French-based Pebeo Paints, Susan Lenart Kazmer's ICE Resin and Amate Studios of Mesa, Arizona's super range of bezels. I received their introductory kit for review. Inside the box were 2 Fantasy Prisme and 1 Fantasy Moon paints, the resin in a mixing plunger kit, bezels, droppers, stir sticks and a small plastic container for mixing the 2- part resin. 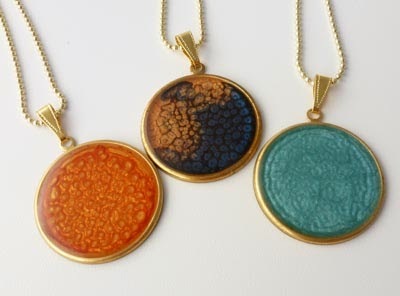 The pendants I found in the box shows off examples of the gorgeous paint colors from the extensive range. Before I let myself loose on the box contents, I watched the 2 minute video on how to make the easiest one of a kind jewelry ever with stunning results. Verdict? A super duper product! I had so much fun, I not only used up the 4 bezels in my kit, I was in great danger of using up my own stash too! The paints come in a variety of colors. Prisme forms a honeycomb effect while the Moon paint results in a stone like texture. The process is fascinating to watch when I tried out the pink and violet Prisme paints in my box. The honeycombing began very quickly but the process doesn't finish for at least half an hour. Even without the resin, the paint has a slight glossy or opalescent finish. Resin though will give the final product a permanent protective layer. The instructor on the video was right, the tiny bubbles disappeared on their own. The paints are solvent based so how the honeycombs form depends on surface tension, rate of evaporation, space restrictions and also paint pigments. It's important to stir thoroughly according to instructions otherwise the effects don't form. The paints look thin to begin with and any accidental spills wipe clean if you do it asap. The solvent smell is not obvious unless you are working on several pieces as I was and have your nose close to them! So best work in a ventilated area if you are production lining your creations! The paints can be used on any surface. 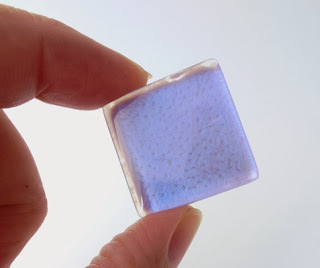 I tested out the violet Prisme on a glass tile. The honeycomb cells were smaller on the tile. The bezel though showed darker rims due to light restrictions. Here is what the reverse side of the tile looked like. Once the tile is coated with a thin layer of resin, the choice is yours which side you like best for the front! 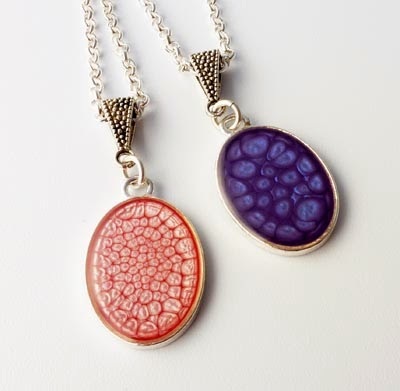 All the honeycomb patterns reminded me of stained biological cells! 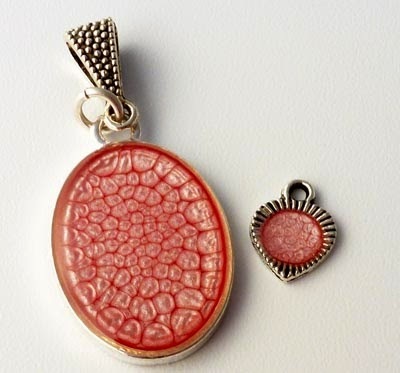 Those of you who studied histology will know what I mean. 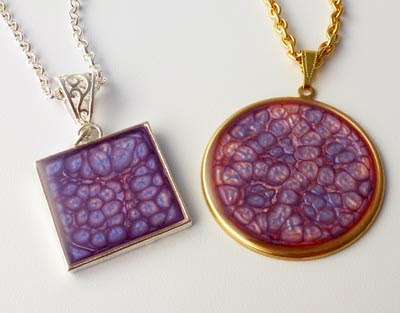 The size of the bezels you use will affect the relative size of the honeycomb cells. I've had a bunch of tiny heart charm bezel for years. Now I know what I can do to colorize them! The bottles were generously filled with 45 mL of paint each (about $6.50- $7 per bottle). A little goes a long way. So you can certainly go ahead and test on cardstock as I did with the silver Moon paint. 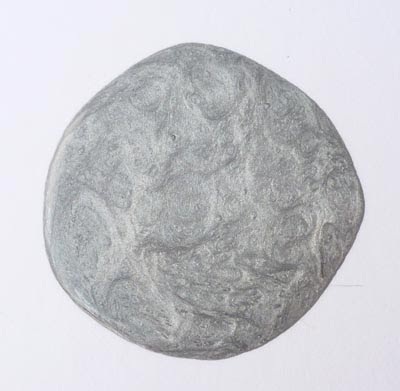 This paint is well named as the resulting texture was rather like lunar rock to me! 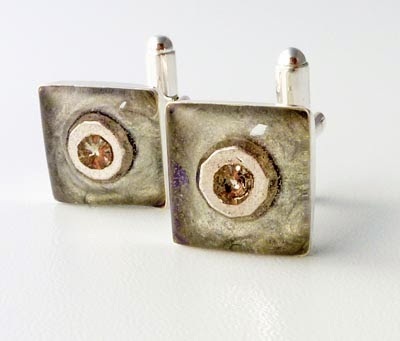 As pink and violet are not really masculine colors, I opted for the silver paint for the cuff links. I added nut like metal beads and Swarovski chatons in the middle for a little bling before covering it all up with resin. If you look closely at the cuff links set, you'll see tiny bubbles - this was the only design I saw bubbles. This is not due to the resin. This is due to me not following instructions! The paint has to be completely dry before resin is added. Thorough drying takes anywhere from 24 to 72 hours. The cufflink bezels were deeper than all the others I used and needed more time to dry than I allowed. So the tiny bubbles are from the paint solvent evaporating through the resin layer. If you're going to add any beads etc, also wait until the paint is dry otherwise you might smudge the lovely effects. Onwards to paint combinations. I found larger bezels really do the Prisme paints justice. I added several drops of the contrast paint all over the base paint for the next 2 bezels. On the left is pink over violet and the right, violet over pink. I also tried the silver Moon paint over the violet and pink Prisme ones. I used the stir stick to move the two paints around a bit on the left bezel. Very different yet cool effects. The pendant below had silver Moon paint over the violet Prisme without any stirring. 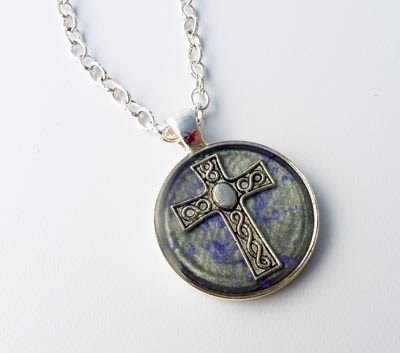 The result reminded me of celestial skies so I added a cross pendant before filling up with resin. This is my favorite piece from all I tried - it is now available in my Etsy store where 100% of the net proceeds will go to cancer research. I also found the paints to be very forgiving during testing. These designs are still a go! 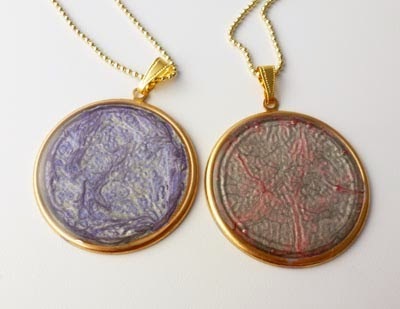 The pendant on the left with a filigree and Swarovski crystal had all three paints in it! The right one had the silver Moon and the pink Prisme where I disrupted the cell structure after an hour. I then created the swirls in the thickened paint with a piece of wire. Looks good enough to eat! The earrings on the left started off with silver Moon paint. I added transparent purple Swarovski margaritas as well as reddish flat back rhinestones. The resin then really softened the whole look. 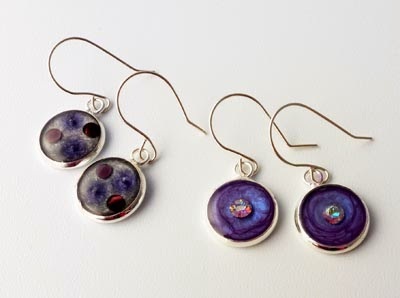 The earrings on the right was the experiment on successive additions. I added the first layer violet Prisme paint, waited an hour and added the second drop. Love the funky style! If you'd like to win a Bezel Effects kit of your own, please make a comment below. Make sure you leave contact info below if you do not have an online shop or blog. Check out the PJTools site for more goodies. It ends in a week's time at 6 pm EST Monday, November 4, 2013. I will pick the winner randomly and announce the results as soon as possible after. So be sure to leave a contact email if you don't have an online link or make sure you come back and check! Otherwise I will redraw in a week. Good luck! Stamped Copper Heart Earrings with a Twist! Wow, I LOVE the honeycomb effect! Thanks for including the time lapse video. I think I might have to try this -- hoping I win one! Wow, those are beautiful. I often wondered what kind of medium was used to make effects like those. Now I know. Winning a kit would be wonderful! Thanks for the opportunity. I would love to try this ! It must be very fun to watch the effect form itself. They are fantastic. I wish I could win. I'm your blog subscriber. I watched the video 3 times. This is so awesome. I have been using the Resin and it is a great product. I would so love to win. I absolutely LOVE the effects that can be created with these products! Pearl, you did a beautiful job with your experiments. My brain is spinning with ideas of things I could create with the kit. I look forward to each of your blog posts (via email & Facebook) because I always learn something. I watched the video 3 times. The technique is awesome. 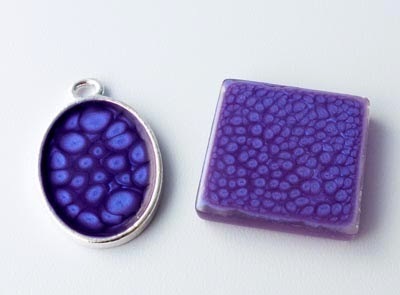 I have been using the Resin for quite a while and it is very easy to use. I would love to win this kit. Well, I actually have a set of Prisme and Moon paints, but I still can't resist this giveaway. The paints are super fun (even when I mess up by not following the instructions) and I could use some more bezels and resin as I'm running out of things to paint at this rate. Oh, me, me random number generator! (: I have been admiring these paints for weeks! Do you know if this kit will be available for sale? I'm also a blog follower! What great effects! So nice to see your examples so we know how to use things. What a fun looking set...lots to experiment with and get hooked on using! I havent seen any of these things so far, but will have to look around specifically for them now. Would be a nice set to work with I am sure. This kit is so inspiring - thanks for your review and the great pictures! I would love to win this kit! This looks like it would be so much fun! I would love to try it! WOW!!! What a cool jewelry making kit. Love the effect---thanks for all the examples you have shown. Definitely have to check that kit out. Yes, yes!!! I have been wanting to try these! I'm a blog, twitter, FB follower. so count me in. wow that is really neat, love the honeycomb effect! This looks like a lot of fun! I am a blog subscriber and a Facebook fan. These are so beautiful -- great idea!!! Thanks for the giveaway. I am already a subscriber to your blog. That is the coolest looking new paint-like-substance I have seen! I would LOVE to have some!! Thanks for all of your give-aways! I absolutely love the effects you can come up with this technique and would love to give it a try. I'm always looking for something new to try and this would be perfect!! MememememeME, pretty please~! I HAVE to get lucky eventually! FUN FUN FUN!! How awesome everything looks!! Would love to win this kit!! And of course, I am a subscriber to your wonderful, inspiring blog! Another AWESOME giveaway! I would love this! I have not heard of this product before, but I love the results! Cool, new toys!!! This looks really fun! I love the patterns the paint makes. That is a sweet box of goodies there. The pieces I could create with those would be an amazing journey. Thanks for this opportunity! I subscribe and shared on FB. OMG this stuff looks awesome to play with. Thank you for the opportunity to win this stuff Pearl. have an awesome day! facebook follower and blog follower. Would really like to win this. It sounds so cool!!! This looks like so much fun! What a great new product that I'd love to try! I bought some prisma paints in a set of 5 colors some time ago and it sure is great to see how they react. Would love to win the set and try the fantasy moon. This looks like so much fun! I love the different effects and color mixes. The video makes it look so easy to do. Oh yes, I am a blog follower. I so want to try these. What cool effects. Happy to say I am a subscriber to your blog and love it! Thanks for all the great info. Looks like so much fun and I love the different looks! I also shared on facebook on my Linda Roberts page. I am blown away by how cool this product ended up looking in the video. I definitely want to try this out and incorporate it into my work! What amazing effects you managed to get with thee paints. I'd love the chance to explore further. What a great new technique. Would love to see how it works. Might inspire me to buy more. This looks like so much fun! I would absolutely love to win a kit. Thanks for the giveaway! I can think of so many different things to do with this kit - and maybe order more colors after experimenting! Wow! This looks great. Meeeeee pleeeeease!!!! I love the look of these. I'd love to give them a try. That is really cool way to add texture as an element. Luv all u wonderful tips and products that u review. I am a subscriber. These are so cool and look like they would be so fun to make. Love it! Didn't you have a lot of fun! This product has really set my imagination careening off in different directions. I just got my resin and some bezels out yesterday, to make some pendants for a craft fair thats coming up. I have to try this product!! Please enter me in the drawing. Thank you. It would be great to win this kit!!! Fascinating! Would love to win and try it out. 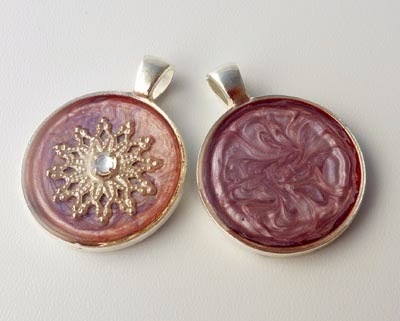 These are great, I've never tried working with resin before. Oh my! I am almost speechless Pearl, and that's saying something! I just love my ImpressArt Stamping Tools as I love to stamp my own words etc. onto metal instead of going with someone else's - so I'm more than grateful to PJ Tools for coming up with those. Now this and what you can do with it is amazing! Thanks for the opportunity to win this kit! Wow, this set looks amazing! I would love the opportunity to try it out! I am a blog subscriber and am glad I didn't miss this post! This kit certainly makes it look easy. Would love a chance to win a kit. This looks like a FABULOUS kit!!!! I already love Ice Resin and these new effects & bezels go with it SO well - would LOVE to win this kit! Thanks SO much for this informative post AND giveaway! This giveaway looks like it was made for me! I've been looking for something new and unusual to try and this is definitely it. Thanks for the chance to win it. That is so awesome! I'd love to win this.I am a blog subscriber via email. I live in an area with out the major craft stores. I have never seen these products and would love to be able to try them. I like making one of a kind jewelry projects. thank you so much. This would be so much fun to try. Must Try this! Looks so cool! Omg this looks like so much fun. What a great project. I'm a bloh subscriber. This is a really cool product. Thanks for the inspiration! Looks like you didn't dry it carefully before using epoxy. If you mean the bubbles in the cuff links, yup! I admitted it in the post!